These false-color images, obtained by New Horizons in December 2017, show two Kuiper Belt Objects: 2012 HZ84 (left) and 2012 HE85. These photographs are the most distant ever obtained by a spacecraft. They are also the closest any camera has ever come to celestial objects in the Kuiper Belt. Image courtesy NASA, Johns Hopkins University Applied Physics Laboratory, and Southwest Research Institute. 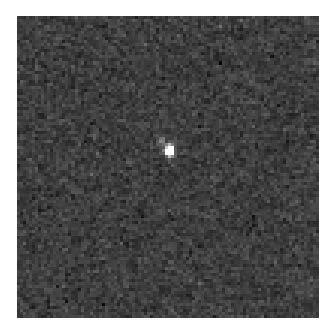 NASA’s New Horizons probe, which electrified astronomers and other space enthusiasts with its 2015 fly-by of dwarf planet Pluto, has now set a record for the most distant photographs ever obtained by a human spacecraft. On Dec. 5 the probe snapped an image of the Wishing Well galactic open star cluster. New Horizons was then 6.12 billion kilometers from Earth. That beat the previous photography transmission record set in 1990 by Voyager 1 when it was about 6.06 billion kilometers from our home planet. But the little probe that can was not yet finished. Two hours after sending home the Wishing Well imagery, New Horizons obtained and transmitted photographs of Kuiper Belt objects 2012 HZ84 and 2012 HE85. All of the December 2017 photographs were captured via the Long-Range Reconnaissance Imager, an 8.8 kilogram-sized digital camera-type device equipped with a telescope lens and reinforced to function in the cold of space. New Horizons visited Pluto in 2015. During that historic rendezvous, the spacecraft approached to within 13,000 kilometers of the dwarf planet. The probe has been in hibernation mode since Dec. 21, 2017. NASA has chosen three possible small objects in the region of space beyond Neptune that could serve as destinations for the New Horizons probe after it visits the dwarf planet Pluto. The agency used the Hubble Space Telescope to select three Kuiper Belt objects, each only a tiny fraction the size of Pluto and ranging in size from 25-55 kilometers. All three KBOs are about one billion miles beyond Pluto. 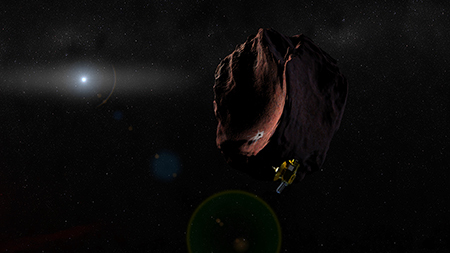 The New Horizons probe is shown visiting a Kuiper Belt Object in this artist’s impression. KBOs have never been visited by spacecraft; they are remnants of the earliest days of the solar system and are found in a region full of icy debris billions of miles from the Sun. Courtesy NASA, Johns Hopkins University Applied Physics Laboratory, Southwest Research Institute. New Horizons will visit the Pluto system next summer. After doing so, the spacecraft will continue to travel deeper into the farthest reaches of the solar system, where objects have remained frozen since the formation of the planets and dwarf planets billions of years ago. New Horizons was launched on Jan. 19, 2006. By the time it reaches the three potential KBOs found by the Hubble Space Telescope, it will have traveled about four billion miles from the sun.